Win $500 Snique Away Credit and Much More! Almost all of us reading this have it very lucky. I know I do. We’re able to read the words on the screen because we were lucky to have been taught how to read and had access to libraries and books where we could improve our reading skills. Millions of people aren’t that lucky. But here’s how you can help and get to have Big Travel with Small Money! Deals We Like connected me with Snique Away who, very graciously, have donated a $500 credit which can be used to buy any Snique Away deal. Snique Away has limited time sales on some great hotels for prices up to 50% off. For example, the current sale includes a Junior Queen Suite at the St. Regis in Vancouver for $120 a night. And past sales have included hotels in Bora Bora and other exotic locales. Snique Away is definitely a site worth keeping in your travel arsenal for great hotels at low prices. There won’t always be hotels in the city you’re visiting, but it will be worth it when there are! I’m very, very grateful to Snique Away for donating the $500 travel credit and encourage you to visit their site and to participate in the fundraiser. 5) You can win more than one prize so there’s no harm in buying lots of raffle tickets! Many of your favorite bloggers, together with 100s of others, are participating in the fund raiser. Bottom Line: For $10 you can win lots of very cool prizes and get a tax deduction for helping young children and adults in Zambia learn how to read and improve their lives. Thanks again to Snique Away for donating the $500 credit and to Deals We Like for connecting me to Snique Away! Which prize are you going to buy a ticket for? @huh! Don’t donate if you wish not to! This is irrational, why a charity has to bribe donors? What a waste plus itsn’t it your own personal responsibility to make it on you own. Unless these funds were restricted to orphans these children are taking money from my family to assist theirs they should get it from their own families despite their resources. Agree with Steve, great cause, nice to give something back during the season of giving. We just put in for $100. Thanks for promoting this on your blog! 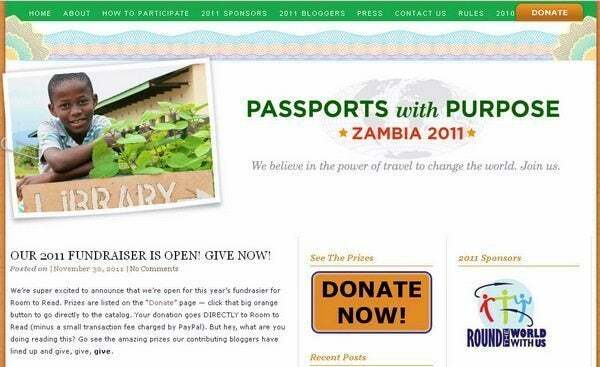 @Deals We Like – Thanks for connecting me to Passports with Purpose! @BothofUs2 – Thanks so much for your generous gift. I really, really, appreciate it! And I hope you win big! @Steve – To echo what Daraius and MommyPoints said, THANK YOU! @TRW – Unfortunately it does not tell you the # of people who have donated/purchased a raffle for each prize. 12:05 pmDecember 1, 2011 T.R.W. @Steve: ahhh, the “# of Entries” is how many raffles you want to purchase. Complete anonymity. Nevermind. @T.R.W – Thanks for donating. You’re a winner whether you win a prize or not!